This was posted by a PCGB member (Howie). I thought it may be useful info to post here. I would like to hear from anyone who has had similar problems with their 996 cab (I will be checking mine this weekend wheather permitting). 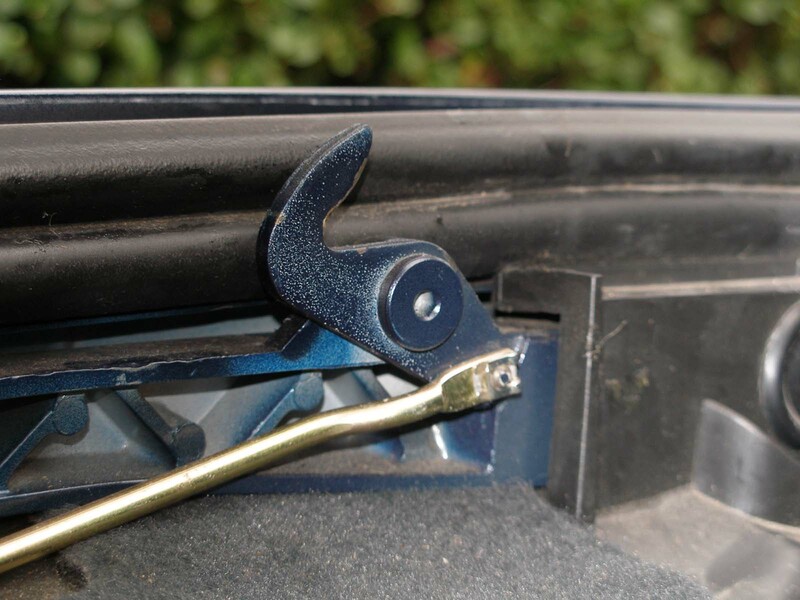 For all those cabriolet owners whose cars are perhaps three years plus I strongly recommend that you check the roof drain outlets which are located behind the rear plastic wheel arch linings. For if these get slightly blocked then, when you wash your car or are in any sort of heavy rain, there is a strong probability that the small internal resevoir will overflow. 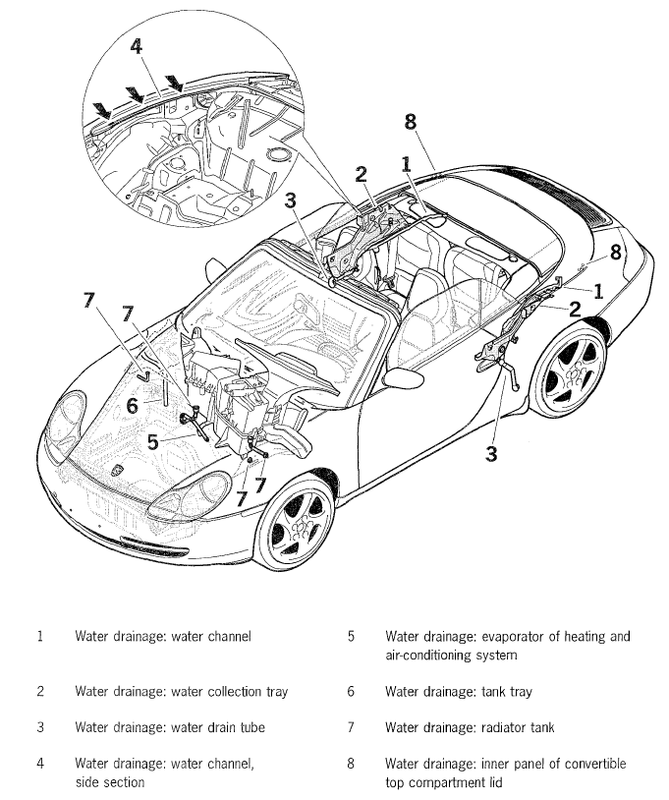 The resevoir is located behind the rear side panel and is ideally positioned so that the water overflows down into the rear seat and the rear floor well [inside the car cabin]. This area is linked to the front floor well via the well below the front seat and trust me it is no coincidence that these areas are called wells for they can hold a lot of water! Over a period of time you will be blissfully unaware that this is happening until it is too late. Then one day, whilst its raining, your car alarm will go crazy, your car will not start and it will have to be dragged of to the repairer. They will eventually find the that EC unit, which does what it says on the tin, has blown up. Why? beacuse its located in the well under the pasenger seat and as we know water and electrics do not mix. The cost of the whole operation was horrendous but the repairer didn't know how the water had got in. It took me the best part of a day to strip out the rear panel and find the problem and fifteen minutes to cure it, which is the time it takes to remove the rear wheel and lining and replace them. So when you have your annual service get them to carry out this little job - it will be cheap in the long run. PS. Boxsters have the same problem I understand. Hi, hopefully this will clear up any confusion. When the rainwater runs off the roof it drains internally and is diverted into an open plastic drain channel, from which it runs down into what is probably best decribed as a hopper - as opposed to a resevoir. From the bottom of the hopper there is a 10/12mm dia outlet which extends, via a tube - I think - down to another plastic outlet set into the internal rear wheel arch. 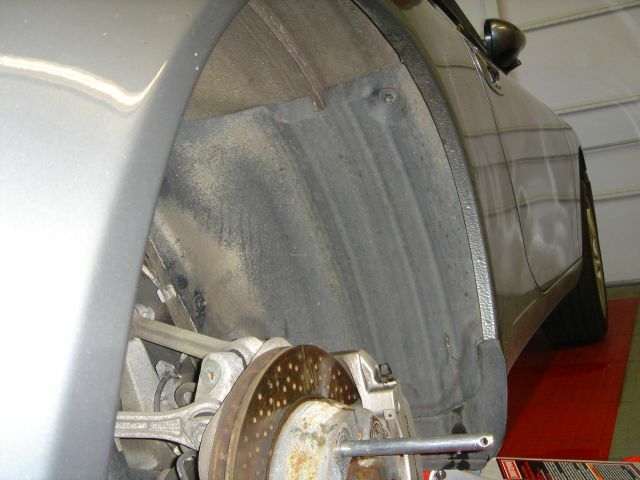 This area of the wheel arch is covered by the plastic internal arch liner. Any water that overflows from the hopper - this better describes the item rather than resevoir - doesn't run onto the surface of the carpet, but behind it where it then soaks into the 50mm thick dense foam backing to the carpet. Even with a good 10mm of water in the foot wells you won't feel the carpet damp. 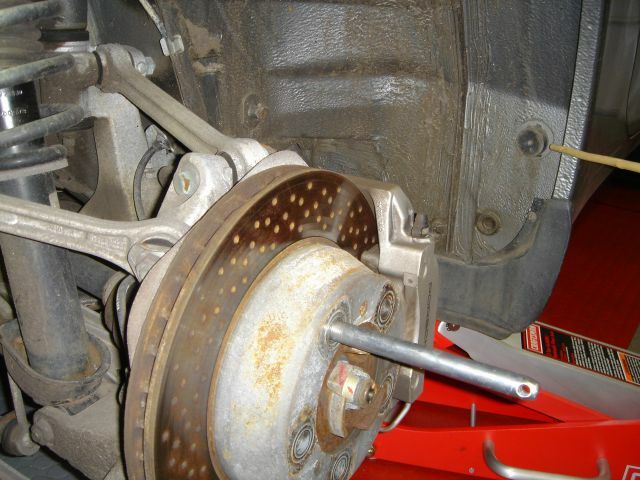 This really is a simple DIY job - the hardest part is getting the large rear wheels back on! There are just three washered nuts holding the plastic liner in place but it will not come out without removing the wheel. Here's what I posted here last February. At the same time I also posted some details on the tools and tricks necessary to gain access to the rear quarter drain area, and to remove the front and rear seats .... so as to remove carpet for drying. Here is the lesson learned for you Cab owners: a small plastic drain tray runs along the side wall behind the inner upholstery panel beside each back seat. A right angle fitting leads from the low point, sideways through the inner body panel and into the void ahead of the rear tire. If you remove the rear wheel, then the forward side wheel well liner, all you see is the metal body panel right behind it. 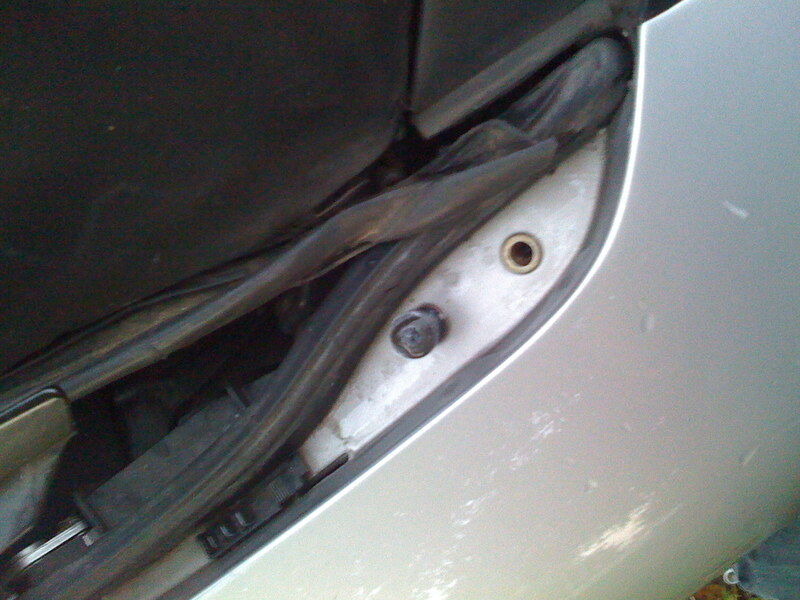 Almost at the bottom of the body panel is the outlet for the drain tube. The outlet itself is a simple plastic check valve with a rubber flapper valve about the size of a nickel. Therein lies the problem. The rubber was stiff with age, and gummed up about 90% with the same kind of crud you clean out of your gutters ... fine, wet, black gunk. When my car was out in the pouring rain at the airport for 2 days, the 10% drain capacity left was clearly not enough to handle the water flow, and a gallon or so ended up in my back seat floor. I pulled the flapper off, blew out the drain with air, then soaked the flapper in Lexol conditioner to soften it before reinstalling. Considered leaving the rubber flapper off, but was afraid that road debris might come in the other way to block it. Going to pull the driver's side wheel and liner tomorrow. My car has been kept in a garage ... no reason to suspect more than average debris in the drain. 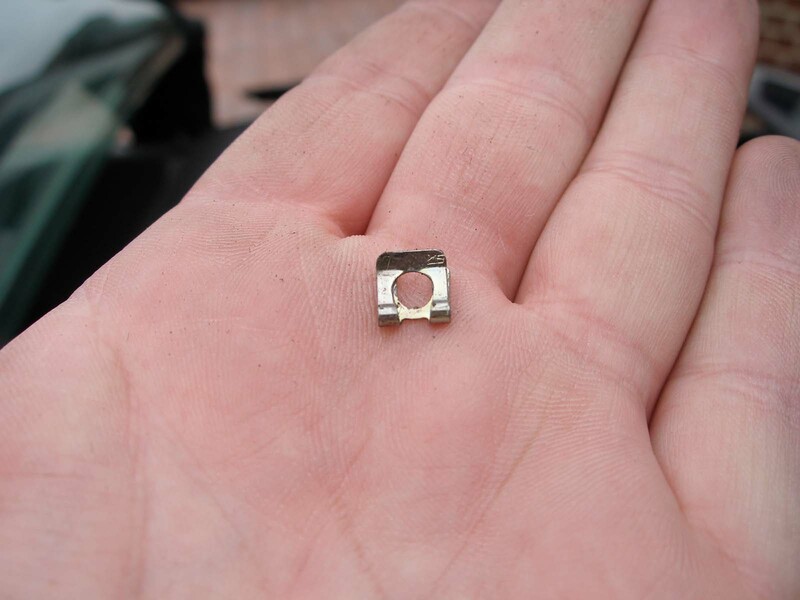 You Cab owners might wish to add this to your "check every now and then" list. Many thanks for that Kim. My intention is to go thru this at the weekend (tommorow if the weather holds up). I will take pics and post here of the process. A question: I haven't looked yet but is removing the "forward side wheel well liner" difficult to do? Where are the screws/nuts for this? Anyone have any pics to share? A question: I haven't looked yet but is removing the "forward side wheel well liner" difficult to do? Where are the screws/nuts for this? Anyone have any pics to share? It is not difficult at all .... after you remove the wheel/tire. Its 3 (or 4 .... 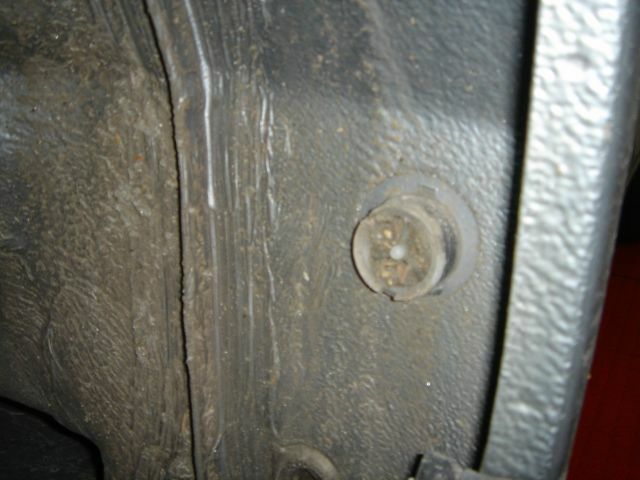 I'm out of town and do not have access to the car) sheet metal screws with about a 10mm bolt head. Liner pops right out. Drain tube exit point is directly behind it on lower portion, covered by small flapper valve. If you have to, as I did, go in from the other end .... removing the side wall panel is quite another story. Rear seat back must come out first, preceeded by the latching bracket for same said seat back. (I could not have completed that part without the manual). It was necessary for me to go in this way because, not only was my drain tube clogged, the two tier tray behind the sidewall had a lead where a short tube drains the upper tray into the lower tray. When large amounts of water (heavy rain or car wash) flowed through the drain system, it leaked at this point regardless of the state of the wheel well drain tube. I imagine, however, that this is an uncommon condition that most aren't faced with. Anyone could post some pictures and put it at the DIY section? That would be very helpful. Any update on this ? I could not find any pictures in the DIY section and ... well I still don't figure exactly where's the drain plug located on how to clean it ?! Here are the rear drains - don't forget the front ones too. Thanks to the previous posters for the instructions. It's a very simple job, I didn't even have to stay at a Holiday Inn Express last night. 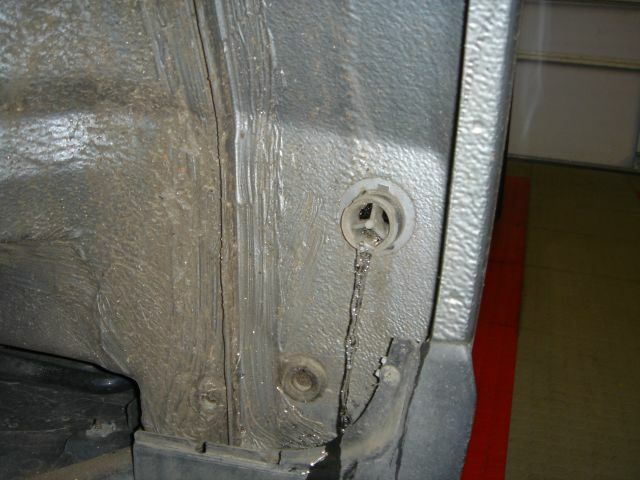 Here's the passenger (right) rear wheel well panel. There are 3 plastic 10 mm plastic nuts holding it on. Here is the drain with the flap in place. Here is the drain clogged up with about 6 years worth of smegma. Here is the drain after cleaning it out and testing it by pouring water on the cab top. N.B. the water also drains out behind the front wheel well too. I've never done this before. I read the instructions, and cleaned both side in about an hour. Anybody can probably do it in way less than an hour but I was messing around with my camera and had to move the car in and out of the garage and the battery was dead and ... you get the idea. Before I wash my Cab, I test the drains by pouring a small amount of water from a plastic bottle into the drain holes. I then look under the car to see if water is coming out of the end points of the drain lines. Test both sides. Cheap insurance to avoid a serious and costly problem. You guys are great! Thanks for the quick responses. I think I have found the source of the leak but, I now sure how to resolve it. In the lower center of the picture you can see a drop of water coming from a quarter-size part with a gold screw in the center. The water is leaking from there. I removed the screw and then tightened it back down but water still comes from that area. It appears to me that there should be a gasket of something there to stop the water. Can anyone verify this????? This is under the dashboard on the passenger side (US) of the vehicle. Is it water or coolant (sweet smell). If it is coolant then you likely have a heater core/hose leak. If it is condensation water then your drain line is likely plugged. Hey Loren. Do you have a diagram for the front wheel well drains? 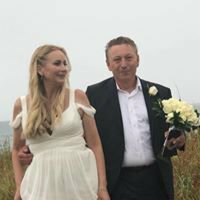 Thanks in advance if you're able to help. Thank you. :thumbup: Lots of questions on this. think mine is blocked with leaves etc. As mentioned in my thread here. Heads-up for cab owners with rear seat speakers... the rear cab drains and the catch trays are right behind the speakers (on my '99 at least). Simply remove the two torx screws, pull the speaker assembly and there it is. You can easily hit both the entry and exit drains from there as depicted in the service drawings above. When I tested it with the speaker off I saw most of the water coming down the slope of the tray rather than through the small flexi tube. Is that normal or a more sinister problem like Kim describes above? 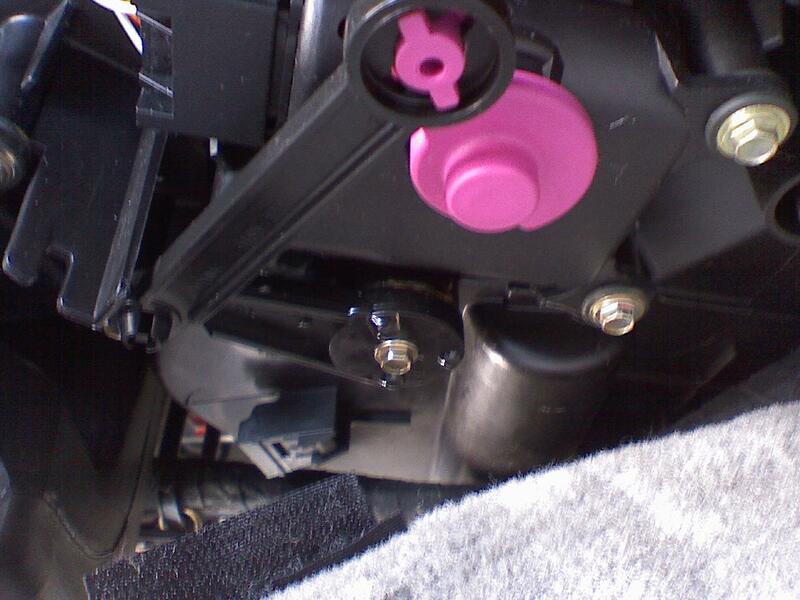 Also if you find water in the boot, driver's foot well and under the rear seat on the other side (i.e. diagonally across from each other) could they all stem from the same problem? If you have water in the boot and front footwells, then it is the FORWARD tubes that must be clogged. Hi Kim thanks very much for the reply. Forward tubes were totally blocked. Now they are cleared as far as I could see from the top. One flexi tube is completely missing and the other is not connected to the rubber part in the top. The whole "down the tube out of the wheel arch" thing is therefore not happening. It just seems to drain straight out the bottom of the car. At the back, from the plastic trays behind the speakers and everything South, the water drains fine. My lack of understanding about what is above the speakers/under the clamshell is the problem (service diagram hasn't helped me on this). I pulled out the tube and found it clear. Plugged it back on to the spout then tested with a hose from the outside. The water MOSTLY ran down the inside of the slope in the tray rather than through the tube. Is this normal? Couldn't get the angle to see where the water was coming from. Just found THIS THREAD showing the drain holes under the clamshell. Doh! That's probably it isn't it? :blush: I'll check these tonight for any relevance to the route the water is taking in to the tray. When I checked out the lower trays behind the speaker I did notice a little clip on the carpet under it. When I had a look under the back of the top, I realised where the water was coming from. 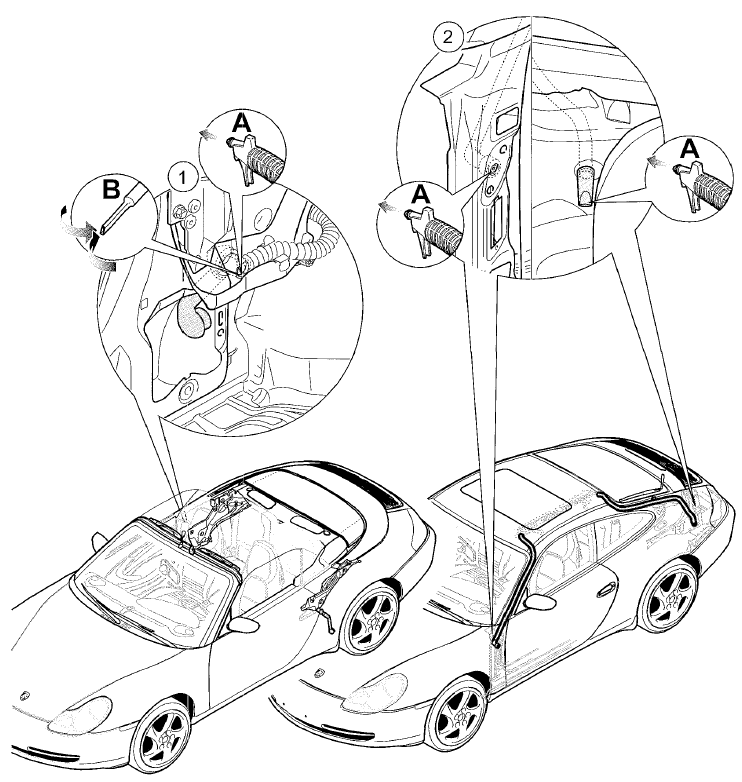 There is a hook either side, driven by a rod that pulls the clamshell down at the end of the hood closing cycle, forming a semi water-tight seal. The clip had come off from where it's supposed to hold the rod and the hook together, hence the hook was not being operated. Does the RTS mounting hole feed into the drain as well or do I need to plug it every time I remove the mounting brackets? I ended up with a rear passenger seat and floor full of water this weekend, and I wanted to make sure I remedy the problem completely. Thank you for the information, unfortunately for me, I became aware of this issue too late. 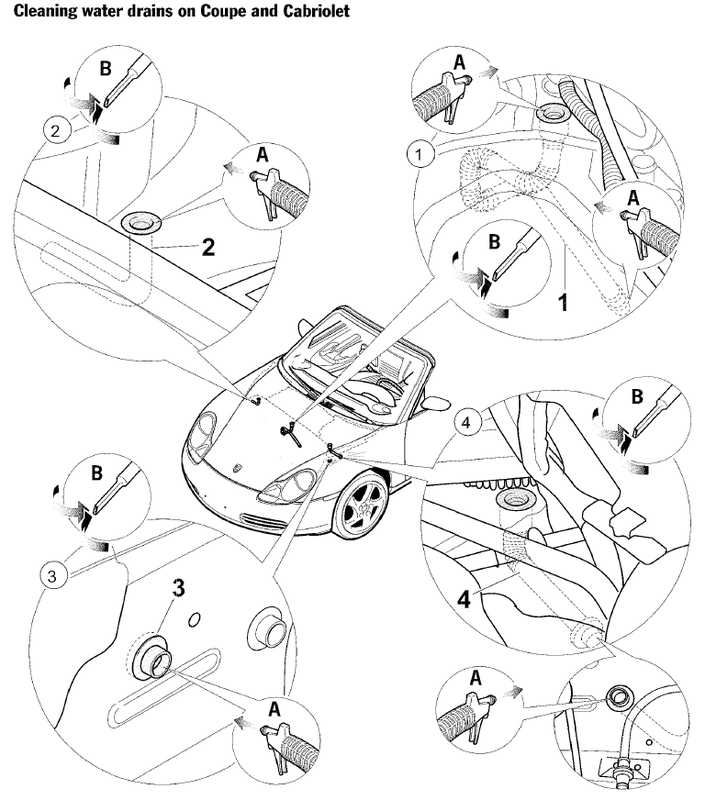 My 2006 Boxster S is now sitting in my garage suffering from a variety of problems...horn blaring, windows moving up and down by themselves, rear spoiler failing, break lights on continuously, etc. What's worse, is, the dealer is claiming the issue is not covered by the warranty. This sounds to me to be ridiculous. Any thoughts would be appreciated. Thank you. I looked last night when I got home to remove some darn bird stuff off my Cab top. Where do you pour this water? I did not see any obvious locations to pour the "Test" water.